Elderberry tea is most commonly made from the flowers that bloom on the elder plant before the berries appear. When fresh or dried flowers aren't available, you can make tea by adding a tincture or extract made from elder berries or flowers to hot water. According to the University of Maryland Medical Center, few studies have been done on the health benefits of elderberry tea, but its benefits seems to come from the plant's antioxidant-rich flavonoids. As with any herbal remedy, it's wise to check with your health care provider before adding elderberry tea to your health care regimen. Drinking elderberry tea can help soothe cold and flu symptoms, including fever, headache, fatigue, sore throat and coughing, according to MedLine Plus, the online health information resource maintained by the U.S. National Library of Medicine and the National Institutes of Health. Make tea with four tablespoons of elderberry extract, and drink it every day for three days for maximum benefits. Though preliminary research shows good evidence exists for elderberry tea as a potential treatment for cold and flu symptoms, MedLine Plus says more research is needed to confirm those benefits. Elderberry may also help treat bacterial sinusitis, an infection more commonly known as a sinus infection, according to the University of Maryland Medical Center. Research isn't clear because studies have used elderberry in combination with other herbs, so the benefits can't be definitively traced to to elderberry alone. Elderberry and other herbs combined with a decongestant and antibiotic helped clear up sinus infections more quickly than decongestant and antibiotic treatments alone. A limited amount of research suggests that elderberry tea might help improve symptoms of bronchitis, according to MedLine Plus. Though research showed benefits for people with bronchitis, the study looked at a mixture of herbs, including verbena, sorrel, gentian root and cowslip flower, in addition to elderberry, making it difficult to attribute the benefits to a single herb. 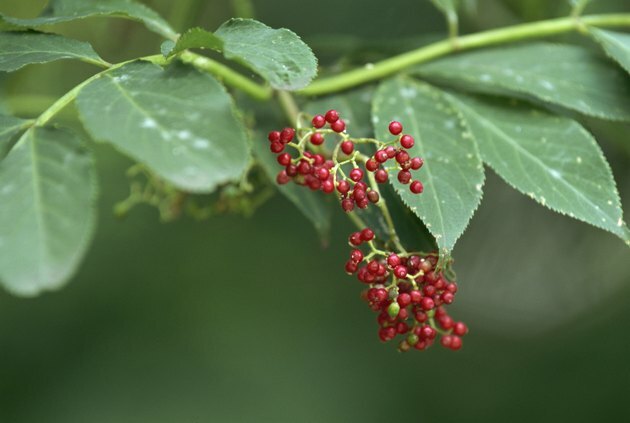 MedLine Plus says more research is needed to confirm that elderberry tea is a useful treatment for bronchitis.